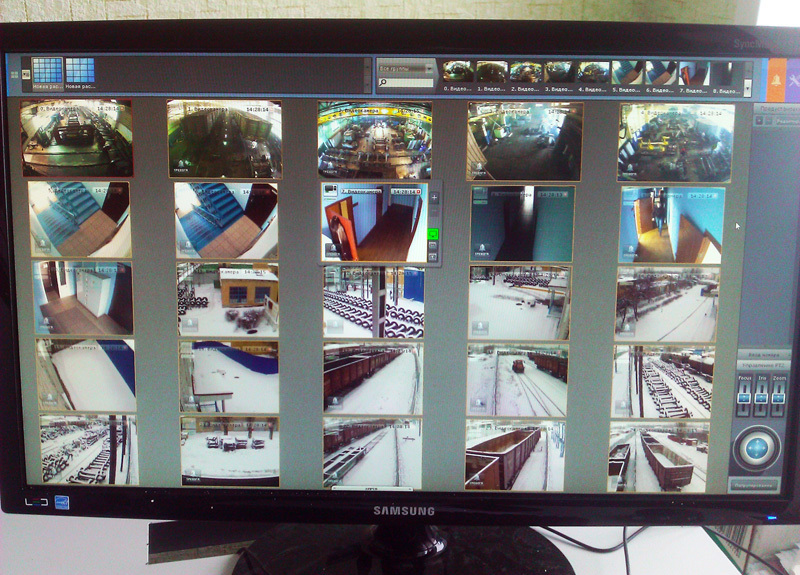 Vympel City LLC installed and activated an Axxon Next based video surveillance system at a rail repair yard in Gryazi, a city in southwestern Russia (near Lipetsk). The repair yard stores a number of metallic spare parts, which are kept inside and outside of the main building. This easy availability creates a tempting target for robbers. Yet the site did not have an outside surveillance system – a mere four analog cameras were installed inside the workshop area. A guard post inspected visitors, but the perimeter was practically unprotected. There were two options for tightening up security: Option 1 was to create more guard posts. Option 2 was to install a video management system, which would display camera feeds at the existing guard post and to all relevant personnel. The second option was far cheaper, so management decided to install a surveillance system to cover all critical areas at the repair yard. Vympel City proposed installing an IP system based on AxxonSoft’s new Axxon Next VMS platform. IP cameras were chosen for their superior video quality and lower overall project costs compared to analog cameras. Part of these savings owed to simpler cabling and bandwidth requirements for IP cameras, such as the ability to power the cameras over an ordinary Ethernet network. Office areas were equipped with five cameras, while 29 cameras monitored the entire outside area and another five cameras replaced the four old analog cameras in the workshop. Video is written to archive on a server installed in the office building. Monitoring and management of the system is performed over the local network from remote workstations. A decisive factor in favor of the use of Axxon Next VMS was the software’s well-implemented support for the ONVIF protocol, which lets the system incorporate almost any ONVIF-compliant IP camera. Another key reason was support for flexible configuration of access levels: the remote workstation at the guard post can watch live video, the security director and yard manager can access the archives, the workshop boss can access only the workshop cameras, and the system administrator has unrestricted access. Deployment of the video surveillance system has ensured reliable protection of the repair yard’s perimeter and prevented inventory loss. The client was also pleased to notice an uptick in workplace productivity. About the partner: Vympel City LLC was founded in October 2007, concentrating in setup, commissioning, and servicing of security and access control systems. The company has installed over 25 systems based on AxxonSoft software. Regular clients include Indesit International, SU-11 Lipetskstroi, secondary and technical schools, and the Interior Affairs Department for Lipetsk and Lipetsk Region. Vympel City provides warranty and maintenance service for all of the systems it installs.